Lock or unlock your Leopard Dock. Is there a better alternative to DockLock? Is DockLock really the best app in System category? Will DockLock work good on macOS 10.13.4? 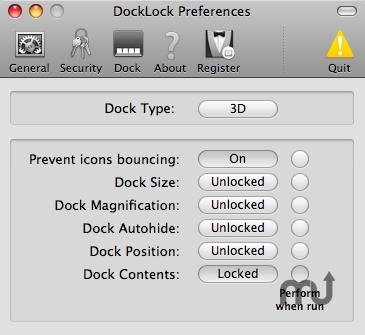 DockLock is a small application that sits on your Dock and with a single click will lock or unlock your Dock. Perfect for those - like me! - who are constantly dragging things off the Dock by accident! Version 2.0 adds much greater control over what gets locked and unlocked. DockLock needs a rating. Be the first to rate this app and get the discussion started!